Sometimes a sneeze is nothing more than a sneeze. Hamsters are like humans in that a bit of dust may cause the reaction. There are also times when sneezing and squeaking are the warning signs that your hamster is either sick or suffering from an infection. You can always try to eliminate the potential cause of an allergic reaction, but getting veterinarian help for your pet is essential. What may seem like a common cold to you can be deadly for your hamster. Your hamster may have gotten a stray piece of dust up his noise, causing him to sneeze. If the sneezing continues, or increases, it could be serious. Check your hamster for other signs of a cold. If there aren't any other signs, the sneezing could be a result of allergies. 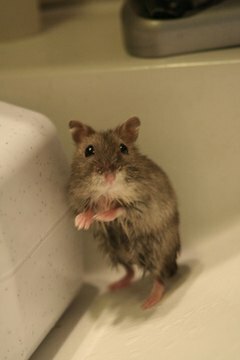 Allergies to wood shaving-style bedding are common among hamsters. The oil in the wood can cause upper respiratory problems. In this case, changing the bedding and a good cage cleaning may be all that's necessary. An upper respiratory infection may also result from improper ventilation. Tank-style habitats aren't well-ventilated, which can lead to infections. Check your hamster for a runny nose, watery eyes, lethargy, coughing and decreased appetite. Get your hamster to the vet immediately if he is experiencing these symptoms. If there is the remote chance your hamster has a cold, it needs to be treated immediately. Hamster colds can quickly turn into pneumonia, which can kill your pet. Even if it turns out to be an allergic reaction, your vet can work with you to determine what's causing the allergy. Change the bedding and thoroughly clean the cage. If you're using cedar or pine bedding, switch to a safer bedding option, such as wood pulp bedding. Cedar and pine bedding can cause allergies and upper respiratory infections because of the wood oil. If you can't get your hamster to the vet immediately, offer a mixture of lukewarm water and milk mixed with a teaspoon of honey to help sooth his symptoms. Take your hamster to the vet immediately upon noticing the signs of a cold or infection. She will likely give you a week's worth of antibiotics to help clear the infection. Keep a close eye on your hamster during the treatment phase. Antibiotics can sometimes cause diarrhea, which needs to be treated immediately or it could result in dehydration and death.